The writing takes a little to get used to, but definitely stick with it. This one is full of humour, Victorian etiquette and a very tough, parasol wielding spinster. I got a lot of fun out of this one, including a hot werewolf romance. The language used was a bit of a culture shock at first. I was almost going to give up on this one, but I like to keep an open mind, so I persevered. I’m very relieved that I did, otherwise I would have missed out on this gem of a book. 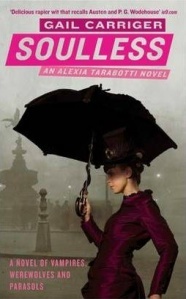 Alexia, or Miss Tarabotti to everyone else, is embroiled in Victorian England’s high society. As a twenty-six year old spinster, she’s long been put on the shelf so to speak after her mother’s second marriage. Looked over for her tan skin and Italian roots, Miss Tarabotti is the Cinderella of the family, with her mother heavily focussed on her other two daughter’s marriage prospects. Little worry falls on Miss Tarabotti however, as she regards herself as actually having a working brain rather than being swept up in the frivolity. Born without a soul, she is preternatural, which gives her the ability to negate the supernatural, a much sort after skill. The supernatural is not a myth, but more a fact of life in nineteenth century England. Weres and vampires walk among the day kind, even attending the occasional dinner party. After an unwanted encounter, making good use of her trusty parasol, Miss Tarabotti starts seeing more and more of the earl, Lord Maccon, the Alpha werewolf. With his Scottish lilt and quick temper, he is nothing if not an even match for Miss Tarabotti’s briskness. The writing style did seem abrupt at first, but I found myself at ease with it quickly. It was written in third person, however POV’s tended to switch back and forth quite a lot. While that didn’t take away from my overall enjoyment, it may be a little off-putting to some. It’s easy to follow nevertheless, first person switching is a lot harder to handle. I found the world in which they live such an interesting one. I love the openness in which the supernatural is publicly accepted and connected with the Queen. Social politics are heavily layered in this book, which I found to be amusing. The fact that first names are hardly used, and when they are, it’s thought scandalous, was such fun to read. I think this book is rubbing off on me with the way I am phrasing myself at the moment. Regardless, I loved Alexia, she was brilliant in her role. While still adhering to the general rules of etiquette for a lady of that time-period, she managed to be unruly in her speech, often holding her own in an argument with any male. Having learnt everything she knows from her dead father’s immaculate library, Alexia is very smart, putting many to shame with the depths of her intellect. However, her remarks in comparing her knowledge of the male anatomy to what she finds in reality were quite funny. I can’t recall the exact quotes, but you will most likely crack up in laughter when you find them. The romance was one of the driving sources of my enjoyment with this book. Having been relegated to life as a spinster, Alexia’s foray was really very exciting, especially with some of things she and the earl get up to. Her best friend, Miss Hisselpenny, always boasting an extremely ugly hat, would have a coronary if she learnt the details of Miss Tarabotti’s escapades. Lord Akeldama was perfect in his role, reminding me of a vampiric version of The Mortal Instruments’ Magnus Bane. He has a love of exuberantly bright fashion, including donning a pair silver of high heels. As a rove vampire, he surrounds himself with a bevy of equally fashionable house boys, led by his favourite, Biffy. 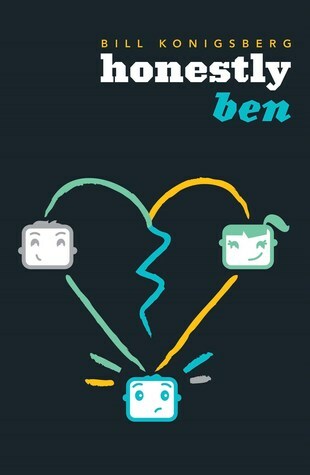 It wasn’t all romance and quirkiness though, but there is an abundance of that. Alexia’s humour is there, even when she doesn’t realise it. The plot revolves around a mystery of supernatural disappearances, adding in enough steampunk-ish action to make this one a thrilling and satisfying read. I’ll certainly be continuing with this series. Those who enjoy their paranormal romances full of humour and Victorian politics. This sounds good! And I always like a bit of humor in my books. You read it..yay! I totally understand where you are coming from when it comes to getting used to Gail’s writing style, now I have zoomed through 3 books , waiting on Heartless to arrive. I think Gail has the best humour and wit about her writing. I smiled alot through these books. I hope you read them all.